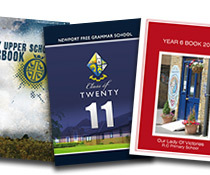 Below is a guide to our Premium A4, B5 and 210mm Square School & College Yearbook printing prices with FREE Delivery. For our smaller Lower Cost A5 and 150mm Square Yearbook Printing Prices click here. 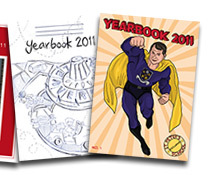 All our Premium High Quality Softback and Hardback School Yearbooks can contain from 40 up to 300 pages. For any special requests please contact us or complete our online quote form. School Yearbooks with a 2mm Thick Board Hardback Cover and Spine printed full colour with a traditional gloss or contemporary soft touch matt laminated finish. All inner pages printed full colour on our Premium 160gsm artic white satin photo book paper. All from artwork provided as a print ready PDF file with bleed, or supplied as a Powerpoint, Publisher or InDesign file. For our low cost yearbook design service pricing please contact us. School Yearbooks with a thick 300gsm Premium Card Cover printed full colour with a traditional gloss or contemporary soft touch matt laminated finish. All inner pages printed full colour on our Premium 160gsm artic white satin photo book paper. All from artwork provided as a print ready PDF file with bleed, or supplied as a Powerpoint, Publisher or InDesign file. For our low cost yearbook design service pricing please contact us. Yearbooks with a 4 page double sided cover printed full colour (outside and inside) with a Gloss or Soft Touch Matt laminated finish on our Premium 250gsm card. All inner pages printed full colour on premium artic white 120gsm satin paper. All from artwork provided as a print ready PDF file with bleed, or supplied as a Powerpoint, Publisher or InDesign file. For our low cost yearbook design service pricing please contact us. Leather Covers: For Gold or Silver Foil Blocked Leather Cover Pricing on our Hardback Yearbooks please contact us. 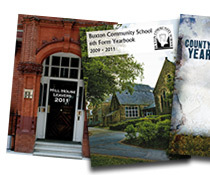 NOTE: As the UK's leading Yearbook Printing Company for over a decade, we can print your school and college leavers yearbook any size not just A4, including A5, B5, 210mm Square, Demi, Royal and US letter sized yearbooks. Just contact us for a Quote. Note: There is no VAT to pay on school yearbooks. All prices exclude artworking. Delivery to the UK is FREE. Full artwork support can be provided on request call 01284 777909. Simply click the button below or call us today on 01284 777909 for more information.